How did Riot Fest land the Replacements reunion? On Wednesday night, Petryshyn finally got to announce the news he had been secretly hoping to spill for six months but had to nail down in the meantime: He landed the Replacements, not only for his flagship festival in Chicago (Sept. 13-15), but also for performances at the offshoot Riot Fests in Toronto (Aug. 24-25) and Denver (Sept. 20-21). “Honestly, I got a little teary when we finally got it done,” Petryshyn said, noting that he and other staffers were up until 4 a.m. today dealing with media inquiries and other to-do’s after last night’s announcement splashed over the web. He wasn’t surprised by the crazed response, though, given the pent-up hope for a ‘Mats reunion someday. “It’s just been way too long for them not to finally do this,” he said. So how did Petryshyn do it? Why Riot Fest, when the band was likely offered more money from bigger festivals such as Coachella? “We’re a completely independent festival run by real music lovers, not a mega-fest that follows trends or worries about album cycles,” Petryshyn said, claiming he doesn’t know how his offer compared to other fests’ promised paychecks. He also credited prior personal connections to both managers involved, Darren Hill (Westerberg’s guy) and Ben Perlstein (Stinson’s). The latter attended last year’s fest in Chicago and was impressed. That certainly helped. "When they were mulling the offer, I highly recommended it," Perlstein said, but added "by no means was the 'Mats playing there my idea." As for all the other questions floating around, neither Tommy nor Paul is planning to do interviews “for the foreseeable future,” Perlstein said. Inquiries about which musicians will round out the rest of the lineup remain unsolved, even including questions sent to the local musicians who were involved in the “Songs for Slim” EP recording. After hosting the "Songs for Slim" session at his Flowers Studio, Minneapolis music vet Ed Ackerson (BNLX, Polara) said he's not surprised these Replacements reunion gigs were announce a half-year later. 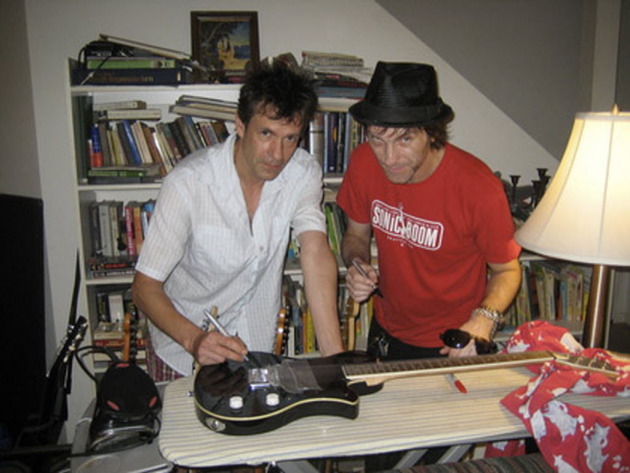 Westerberg and Tommy Stinson circa 2010, when Stinson organized an auction for Haiti's Timkatec Center. "The energy between Paul and Tommy has been fantastic lately, and when the two of them get together there's an amazing chemistry that is 100 percent real and 100 percent Replacements," Ackerson said, declining to comment on talk of more recording sessions. "There's no question that they have the vibe in spades right now." And then there’s the biggest unknown for local fans: Currently, there are no indicators that Westerberg and Stinson will play a hometown warm-up gig. And yes, the folks at First Ave have heard the news and don’t need to be told they should call them up. On the upside, Petryshyn did say there is no contractual cause that would prevent the band from playing here. The only insight Petryshyn has into the band's Riot Fest plans is set length. They will have about an hour to fill at each fest, with 15 minutes or so wiggle room for an encore. A sign of his excitement, Petryshyn later sent along a link to a ChicagoMag.com blog post featuring a bootleg of the band's final show at Grant Park in 1991. The recording quality is surprisingly decent as 'Mats bootlegs go, and the performance even better (sounds like they wanted to go out with a bang). Best of all, though: Dig that photo with Chicago Magazine post showing Slim Dunlap in full guitar grind. There's also a funny little bit in the bootleg just before "Waitress in the Sky" where it sounds like Westerberg is shooing away a photographer. "Want to see me do my Axl Rose impression?" he asks. Only seven years later, Stinson would join Guns N' Roses.